The City of London's Metropolitan Police was one of the earliest forces to introduce a Mechanised Constabulary Division. 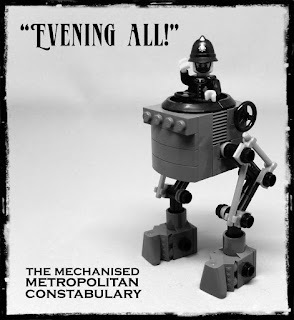 The first mechanically-assisted Constables took to the beat only fourteen years after the Met's founding. In this, as with the adoption of advanced detection methods and psychological profiling, Scotland Yard was to prove ahead of its time, blazing a trail for police forces around the world to follow. The arrival on the capital's streets of the fearsome contraptions was met with dismay by London's criminal underclasses. Nothing put a quicker stop to a tavern brawl or unlicensed political assembly than the stomp of one of the "Automatic Peelers", as the Mechanised Constables became known. The burgeoning middle-classes also regarded the new-fangled police machinery with trepidation. Letters of complaint arrived regularly at the offices of The Times, raising the issues of startled horses and ladies of gentle nature being overcome by the mere sight of the mechanical behemoths. Questions were asked in the Houses Of Parliament, with the Prime Minister quizzed at length over the damage done to flowerbeds in Hyde Park by a Constable in powered pursuit of a vagabond. Despite these concerns, the Mechanised Constables became a common sight on city streets throughout the Empire, and eventually a reassuring symbol of the maintenance of order.